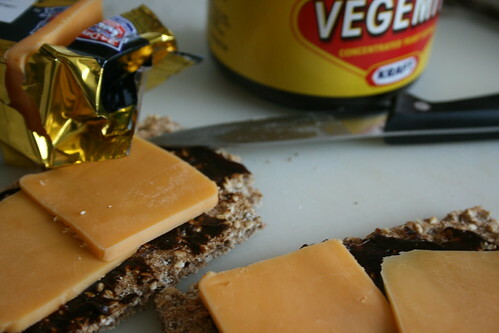 Anyhoo, and to make a short story longer than it needs to be, I have found that this orange cheese goes most excellently with Vegemite both taste and texture-wise, though in this example the effect is spoilt somewhat by the rye which should be replaced by the kind of thin white bread that never goes mouldy but always sticks to your tongue. You know, I always wondered why Thin Oprah said grated carrot on salad was exciting because it looked like cheese. Thank you so very much. Do they have avocadoes there? They grow many in Israel, but perhaps they’re not kosher where you are? I ask because vegemite and avocado is the finest combination of all. We always say that American cheese isn’t cheese at all – it’s softened plastic. And that whipped topping? that comes in a tub? That’s whipped vinyl. So you end up with vinyl, white slush and brewer’s yeast on your insides. Fantastic. i think it’s something to do with it being called cheddar. i remember a couple of violently coloured cheddars in England, but they seemed natural, possibly because a wider spectrum of cheese colouring was allowed. American cheese is weird – either orange or white depending on the variety, tastes good, but. I am reminded of a play I once saw in Chicago where the gimmick was “30 plays in 60 minutes”. This play was entitled “never eat anything the color of a lifeboat” so apparently they think it’s weird too. I second the avocado and Vegemite call. On toast, maybe with a slice of tomato if you’re feeling adventurous. Having grown up with orange cheese – it didn’t come in any other colour in Ireland when I was little – I don’t find it disconcerting at all! Hmmm, that reminds me of the Kraft cheese you’d get in the 1970s – it came in huge blocks wrapped in foil and in a cardboard box that – and this is rather alarming when I think about it now – was sold unrefrigerated.